We got the REAL cast on Wednesday. Dennis told the Cast Master he wanted green. I thought that was a strange request as his favorite color is orange. I asked Dennis why he chose green. He said because Mr. C told him to. 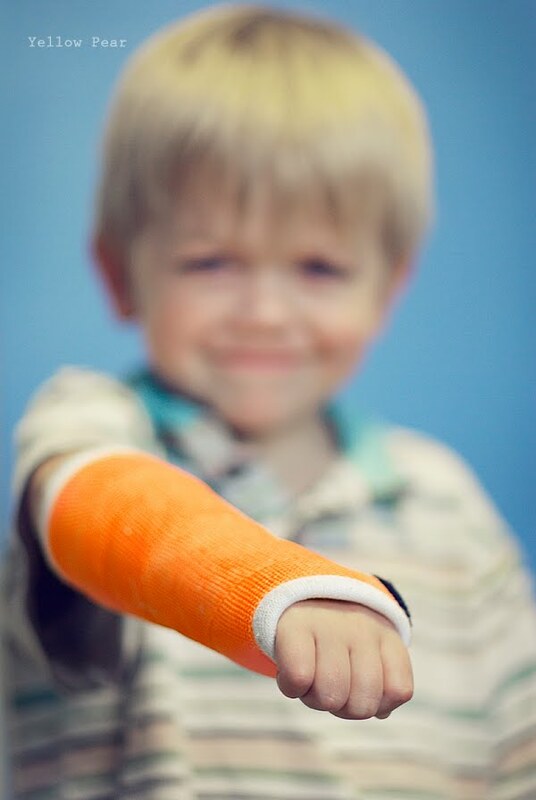 We told him it was his cast not Mr. C's and so he should pick his own color. He thought a minute and said he changed his mind to orange. Glad we got that straightened out. Why is it that he blindly follows his brother's orders but it takes me about 400 requests to get him to make his bed? And the nice gentleman attached a thumb guard (see the little black smidgen) to save his little thumb from being rubbed raw. He was a very nice Cast Master. Dennis loves the thumb guard. He keeps explaining to us how it's to guard his thumb. He's a genius. I'm just glad it's a short cast. It will make life so much easier for him...and me for that matter. It does make you wonder why they they listen and follow certain people. At least it was just following a request to pick a color. SOMEONE convinced Abigail to pee in her Aunt Reagan's bathtub during a family dinner. Oh yeah! The whole family was there when the first cousin came to tattle.... joy. awesome. As a lover of all things orange, I think he picked rather well. And I love how you referred to him as the Cast Master. Very nice. When our castmaster walked in when Seth had a broken leg, Seth looked up at him and said, "are you Doctor Bones?" And I hear you on the short cast thing...I was SUPER relieved to hear that Seth was going to get a cast only from the knee down because it made my life so much easier. I hope he heals well, and fast! Oh, that Dennis! He needs thick, rubber clothing to pad and protect his pillaging personality. Since C is so persuasive, perhaps C could entice Dennis to bed each night...? I love the orange! That is crazy that he broke his sweet wrist...he sure does sound tough. No crying! The bike is great...very classic and ladylike. What a sweet hubby you have. I also LOVED the suckers with photos on them, very creative indeed. Love the sweet new bike. Your shoes in the pictures go perfect so you should wear them everytime you ride. Love that C has that kind of persuasion with N, maybe next time he will use it to convince him not to jump off things. Maybe Mr. C could start asking him to make his bed...Just a thought.